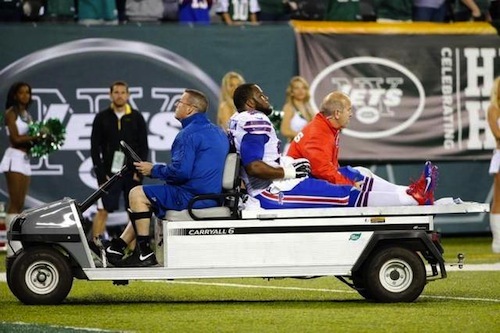 Home » Sports » [Football Friday] Mounting Injuries, Mounting Losses? And somehow, it’s always rougher to the Buffalo Bills! I remember just a few years ago when there were seventeen (or more?) 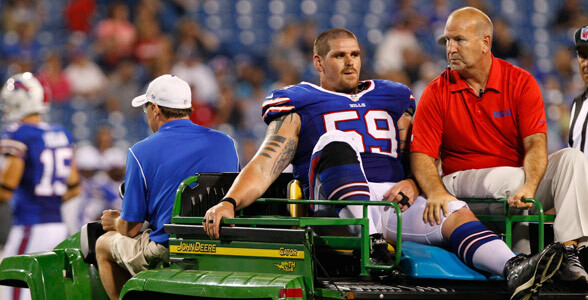 players on the season-ending Injured Reserve (IR) list! That’s a third of an NFL roster! Yikes! I put an asterisk next to each of the guys who are starters. And the other guys are players who would be in there for many snaps. 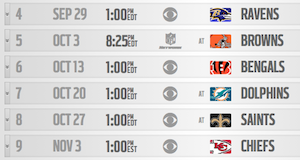 As if the injuries weren’t enough by themselves… have you seen the Bills’ schedule? There are two 2-1 teams (Baltimore, Cincinnati), and THREE teams with perfect, 3-0 records! (Miami, New Orleans, and Kansas City—the first two are road games!) Holy. Moly. Even with all of those players on the injury list above, those games would be tough. But without them? Buckle up, Bills fans. This could get bumpy! Oh No! Our QB is on FIRE! One week, you’re the savior of the world, next week… not so much. Last week EJ was sacked EIGHT times, and for some strange reason he kept throwing balls 5 or 6 yards out of bounds? (EJ, that’s a good way to avoid INTs, but you also avoid the completions.) He looked skittish, scared, scurried, and all things of that sort. To be fair, the offensive line and the run game sort of set him up to feel (and act) that way. The blame can not all be placed on the quarterback. That said, last Sunday, it was pretty obvious that he is a rookie. 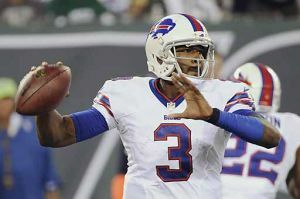 Will EJ Manuel still look like he’s on fire in week four? OR, will be be “on fire”, besting his yards, touchdowns, and any other marks he’s set so far in his fledgling career? Well, I missed last week’s prediction. Pretty badly, actually. Greatly underestimating the somewhat no-name Jets’ defense, my 27-13 Buffalo win turned out to be a 27-20 LOSS. Stinky. This week, I shall be more conservative. And honestly, I hope that I am wrong two weeks in a row. The Ravens are also coming into Orchard Park injured, but they still have their highly-paid quarterback. I have a hard time believing that our fourth-string and on down the depth chart cornerbacks (and backup safety, I might add) will be able to stop Joe Flacco and whomever he chooses to throw to. Baltimore should win this one somewhat easily. I think one thing we will find out this week in Buffalo is the skill, talent, and ability of the rookie coaches (as well as the rookie quarterback). Doug Marrone and Nathaniel Hackett will need to free up CJ Spiller and EJ Manuel somehow, while Mike Pettine will have to figure out a way to run his crazy (and good) defensive scheme with fourth-stringers! I do hope they can get it done. We’re about to find out!